Hold + + on controller 2 and then hold + + on controller 1 until the Mode Select screen appears. 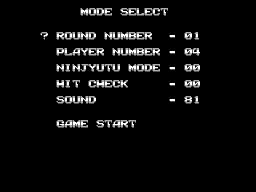 You can select the starting round, number of lives, "Ninjyutu mode" (infinite magic), invincibility and a sound test. Wait until you've collected 999 N points before using any ninja magic.